A-HOTEL.com - Luxury and cheap accommodation in Kholmogorovskaya Sloboda, Russia. Prices and hotel, apartment booking in Kholmogorovskaya Sloboda and surrounding. Located just 2 minutes' walk from Ulyanovsk Barateevka Airport and the Museum of Civil Aviation, Airport Hotel features a cafe. Rooms come with a kettle. Directly overlooking a scenic man-made lake, this 5-star hotel in Ulyanovsk offers classic-style rooms with free Wi-Fi. In summer, guests can enjoy a modern water park, beach bar and rental boats. Offering a spa and wellness centre, Mini-hotel Medvedeff is located in Ulyanovsk. Free WiFi access is available. Situated in the Zasviyazhskii district in Ulyanovsk, Apartment Otradnaya 84 provides an equipped accommodation with a balcony and free WiFi. The property has garden views. Located in a quiet residential area of Ulyanovsk, a 10-minute walk to Aleksandrovksiy Park, Apartments on Otradnaya 79 offer self-catering accommodation with free Wi-Fi. Free parking is available. 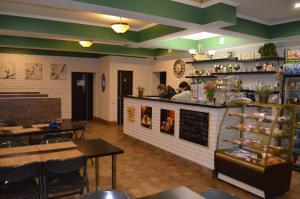 Featuring free WiFi and a restaurant, Art-Ulyanovsk Pravy Bereg offers accommodation in Ulyanovsk. Guests can enjoy a meal at the restaurant. Located in a quiet residential area of Ulyanovsk, a 10-minute walk to Aleksandrovksiy Park, Apartments on Ryabikova offer self-catering accommodation with free Wi-Fi. The modern apartments feature a balcony. Located in the centre of Ulyanovsk, Apartments on Otradnaya and Kho Shi Mina offer self-catering accommodation with free Wi-Fi. Free parking is available. This hotel offers a shuttle service from Ulyanovsk Baratayevka Airport and Ulyanovsk Train Station. Guests enjoy colourful rooms with a flat-screen TV and spacious restaurant serving traditional, Russian food. A 2-minute walk from the scenic Vinnskaya Rosca Park, this hotel offers free transfers to Ulyanovsk Main Station and Ulyanovsk Airport. It features a free Wi-Fi and a café. Located in Ulyanovsk, Kleopatra Hotel offers an indoor pool and a sauna. This room features a working area and a flat-screen TV. Located in Ulyanovsk, ViaLetto Minihotel Apartments offers accommodation with a balcony. Free WiFi is offered. Situated in Ulyanovsk in the Ulyanovsk region, 1 комн. квартира с прекрасным видом features a balcony and river views. квартира is set in Ulyanovsk. Guests have access to free WiFi. Situated in the Zasviyazhskii district in Ulyanovsk, ул.Аблукова. Set in Ulyanovsk, На набережной provides accommodation with a balcony and free WiFi. This apartment offers ski-to-door access. A small indoor pool and a 24-hour café serving Russian cuisine are featured at this hotel. It offers a free shuttle service to Ulyanovsk Centralniy Airport, 13 km away. Транспортная 8 is situated in Ulyanovsk. Guests staying at this apartment have access to a fully equipped kitchen. Offering free WiFi and city views, Minihotel apartment na Transportnoy Ulitse is an accommodation situated in Ulyanovsk. This apartment provides accommodation with a balcony.